Today I choose to write again about the primacy of federal law. I keep returning to this important part of our U.S. Constitution because it seems that many young people are not being adequately taught these principles and features of our federation. Yes, we are a system of federated states. 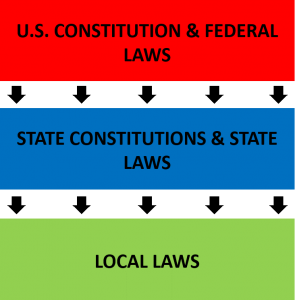 Our federalist system prescribes the statutory relationship between the states and the federal government. It is a strong federation — not a loose confederation of states. Switzerland is a confederation, but our United States are indeed united in a durable, strong federation. This fantastic system makes for our current exceptional American arrangement. This means both states and their citizens must obey laws that emanate from a constitutional enumerated power, such as regulating commerce, providing for the military, establishing post offices or borrowing on the credit of the United States. Ok, here is where it gets dicey. There is no specific enumerated constitutional clause granting the federal government supremacy in immigration laws. Using our knowledge about supremacy of law, we can state that technically, a state can indeed set its own immigration policy unfettered by the federal government. Our old friend, common sense, enters the debate at this point. Common sense holds that immigration law and policy should be national in scope and not left to the states. Imagine if Texas had a much different immigration policy than Arizona did. If one was much freer than another, immigrants would enter the United States through the state with the freer provisions. Once admitted, they are of course free to undertake inter-state travel and choose to live in any of the 50 states. Sanctuary states and cities typically employ the argument that in this area of immigration law, the supremacy of federal law does not apply. Again, they are right and wrong simultaneously. They cannot make policy or take actions that frustrate the federal ability to enforce its immigration laws and policies. On numerous occasions, the U.S. Supreme Court has opined, “the federal government has broad and exclusive authority to regulate immigration, supported by both enumerated and implied constitutional powers.” Well, like I said — I see no enumerated power and an implied constitutional power is hardly anything we should give durable status to. If the federal government wishes to enjoy the favor of the U.S. Supreme Court in the future on this important social issue, then I believe Congress needs to pass comprehensive immigration reform laws that can serve as the substantive basis for it. It is fully legal and permissible for the federal government to not favor states, counties and cities that don’t comply with the supremacy of federal law. A typical federal course of action would be to withhold or lessen governmental grants to those entities that do not comply. A stronger and more lasting solution however, would be to enact congressional legislation that addresses unclear areas and could be supported by every state. We are blessed to have a constitutional republic form of government— a nomocracy. Law, not the whims and preferences of elected officials, rules supreme. Not being able to change laws easily is a desirable feature of our nomocracy. A good example of tension between the states and the federal government is the current flap about immigration regulation and sanctuary areas. My personal belief is that this is a national issue and common-sense dictates that the federal government should be able to set standards for citizenship (which it does) and residency (which it wants to do). This can only come from an act of Congress, which is supreme if it can be shown as pursuant to the U.S. Constitution. One could point to the so-called elastic clause (the catch-call federal enumerated power) because the framers, smart as they were, chose not to enact on immigration. The glue that binds our constitutional republic together is the rule of law — that law should govern, not the arbitrary decisions of politicians or judges. It is exactly this rule of law that has buoyed our republic through the toughest of challenges, both internal and external. We will find suitable, acceptable answers that will work for every American on any issue if we respect our nomocracy. Author: Bob Brescia currently serves the University of Texas as a leadership consultant. His latest book is Destination Greatness – Creating a New Americanism. Bob has a doctoral degree with distinction in Executive Leadership from The George Washington University. He also serves as Chairman of the Board at Basin PBS – West Texas public television. Please contact him at [email protected] or Twitter: @Robert_Brescia.